To celebrate the premiere of the final season of the HBO series Game of Thrones, Jennifer and Mallory discuss names from the book series, A Song of Ice and Fire by George R.R. Martin. Did you know there are 2,054 named characters between the books and the television series? 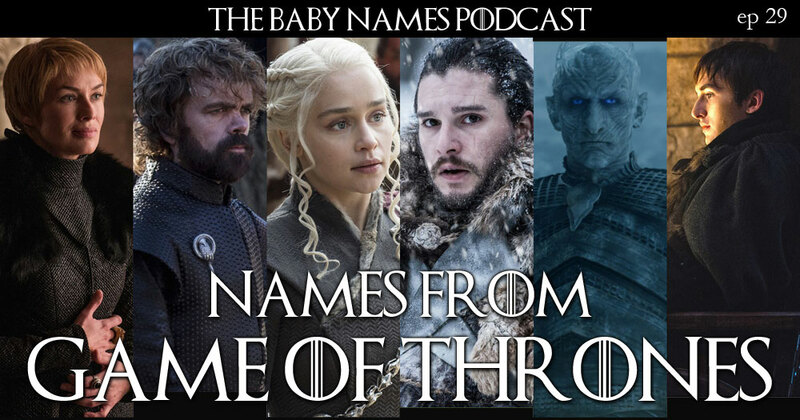 We can’t possibly mention them all, but we do talk about Martin’s naming conventions, how he created names, some of our favorites, and what GoT names you should not name your baby. We also dish about celebrity baby news and take listener questions on names and naming. Jolyon, Ufuk, Abelina, Agata, Pala, Sigmar, Jondor, Catelin, Arya, Sansa, Daenerys, Khaleesi, Androw, Jodge, Melisandre, Hodor, Theon, Tyrion, Cersei, Benjen, Mallor, Rennifer, and more! Have feedback about the show or a baby name question for Jennifer and Mallory? Write us at podcast@babynames.com.